We luckily made it to the Portland airport on time and as planned reached Miami early morning 5am. Slept till late afternoon and evening visited a near by place called The Dolphin Mall. After coming from Seattle, where you are covered from head to toe its such a relief to wear your Summer dresses in december. 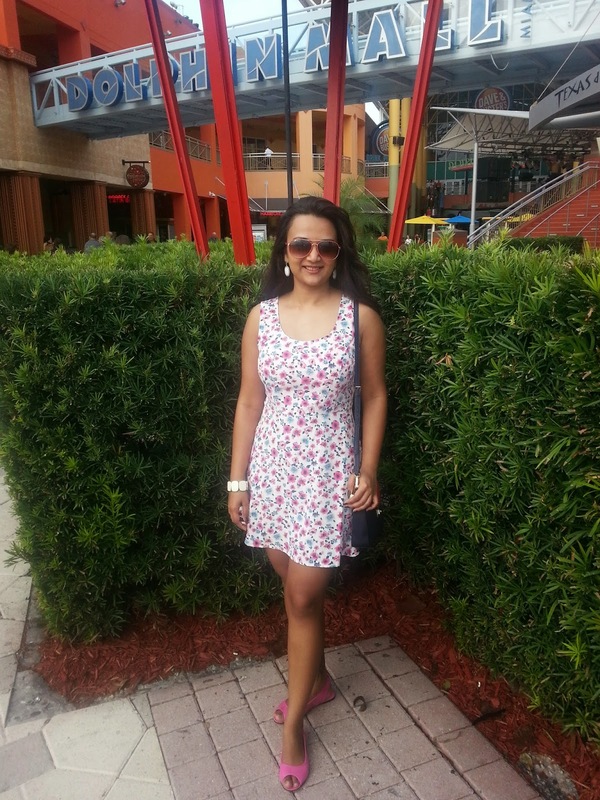 I wore a floral skater dress from Forever21 which brightens up my mood. I paired it with white marble ear rings, bracelet and my cotton candy pink sandals. I love wearing prints and when its floral its even better as it puts you instantly in a jolly good mood. The advantages of wearing a skater dress are doubled for a girl with bottom heavy figure, like me. It just covers the trouble areas and flatters the waistline which I love. The floral skater dress is not just my favorite but also my girl friends love it. They borrow it from me and style it differently. I also styled the same dress in 3 different ways for winter. To check that go here ! Skater dress are also very girly so makes you feel young, i guess. To read about yet another Skater dress click here! Have fun in the sun!! Hope you are having a wonderful day! U look fabulous..love ur dress. Hello lovely! Such a cute outfit! Yes, I'd like us to follow eachother on GFC! I just followed you and now I'm waiting for you to follow back :) Let's keep in touch! super cute dress. I have been to Florida a few time but never gone to dolphin mall. I'm jealous about that warm weather! Wow your dress looks so beautiful! 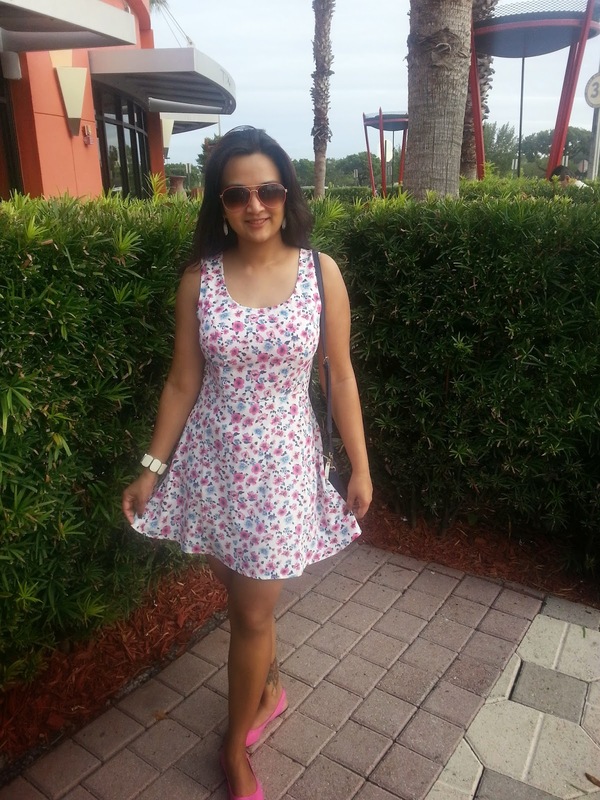 You looking lovely in that dress Ananya... Enjoyyyyyyyyyy the OSM weather.. Warm weather! cool dress! Enjoy the sun! Florida is on my list as I have seen most of East Coast by now. Thank u all for ur kind words !